Jay and Glo’s relationship is more than just Sun sign compatibility of Virgo and Sagittarius. No individual is a pure Virgo or Sagittarius but instead is a unique combination of signs and planets. The following interpretation defines the synastry or interplanetary aspects between the planets in Glo’s birth chart and the planets in Jay’s birth chart. There is no evil planet in the combinations. No single combination can make or break the relationship. The list goes from the most harmonious (positive) to the most discordant (negative). Glo’s Jupiter Trines Jay’s Uranus (+14.69 harmony) – Glo’s sense of growth, expansion, or generosity combines very effortlessly with Jay’s sense of independence, freedom, and originality. Glo’s visions are in harmony with Jay’s creative genius. Glo will expand Jay’s goals and creativity. Jay adds innovation and excitement to Glo’s projects. This aspect brings out humanitarian qualities in each other. Glo’s Jupiter Trines Jay’s Neptune (+11.47 harmony) – Glo’s sense of growth, expansion, or generosity combines very effortlessly with Jay’s sense of spirituality, imagination, or mystical inclination. Glo’s expansive dreams are in harmony with Jay’s intuitions. Both are spiritually compatible. The relationship encourages idealism and charitable instincts in each other. Glo’s Venus Conjuncts Jay’s Venus (+8.16 harmony) – The individual sense of sexuality, attraction, or intimacy combines with ease within the couple. There is harmony in the way each other expresses affection. Social, cultural, and financial values are the same. Both enjoy the same pleasures in life. Glo and Jay have the desire to help and encourage each other. The relationship can lead to a long-term partnership. Glo’s Venus Trines Jay’s Mars (+6.87 harmony) – Glo’s sense of sexuality, attraction, or intimacy combines very effortlessly with Jay’s sexual drive, temper, and powers of self-assertion. There is harmony in the desire of Jay and loving nature of Glo. Both are strongly attracted to each other. This aspect is favorable in marriage and offers a fulfilling relationship. Jay’s Mercury Sextiles Glo’s Mars (+5.28 harmony) – Jay’s mentality and powers of perception combine pleasantly with Glo’s sexual drive, temper, and powers of self-assertion. Both stimulate the exchange of ideas and self-expression in each other. The relationship inspires a lively and productive conversation. Jay’s thoughts and opinions are set in motion by Glo’s encouragement. Jay’s Mercury Trines Glo’s Saturn (+4.84 harmony) – Jay’s mentality and powers of perception combine very effortlessly with Glo’s sense of commitment, necessity, or duty. Glo helps give form to Jay’s ideas. Jay learns a lot from Glo’s knowledge and wisdom. There is harmony when Glo offers practical guidance that improves Jay’s life. Both tend to solve relationship problems through careful and logical communication. This is a favorable aspect for long-term relationship including business partnership. Jay’s Sun Trines Glo’s Saturn (+2.15 harmony) – Jay’s sense of identity, ego, will, and character combine very effortlessly with Glo’s sense of commitment, necessity, or duty. There is harmony and natural respect for each other. Jay and Glo are both willing to work out difficulties in their relationship. There is a mutual appreciation of responsibility and heartfelt commitment to one another. This aspect aids endurance in marriage. Glo’s Sun Sextiles Jay’s Saturn (+1.19 harmony) – Glo’s sense of identity, ego, will, and character combine pleasantly with Jay’s sense of commitment, necessity, or duty. Glo and Jay can stimulate each other to work towards their common goals. There is a sense of practicality in the relationship. Glo and Jay can agree on how to handle their problems. Both know how to allocate duties and responsibilities. Glo’s Mercury Sextiles Jay’s Saturn (+1.04 harmony) – Glo’s mentality and powers of perception combine pleasantly with Jay’s sense of commitment, necessity, or duty. Jay helps give form to Glo’s ideas. Glo learns a lot from Jay’s knowledge and wisdom. There is natural stimulation when Jay offers practical guidance that improves Glo’s life. Both tend to solve relationship problems through careful and logical communication. This is a favorable aspect for long-term relationship including business partnership. Jay’s Neptune Sextiles Glo’s Pluto (+0.90 harmony) – Jay’s mystical or spiritual inclination combines pleasantly with Glo’s sense of transformation, change, or power and destiny. The spiritual urge of Jay stimulates the reforming urge of Glo. Both will support and encourage each other’s spiritual enlightenment. The relationship inspires each other to meet the world with compassion and grace. Glo’s Neptune Sextiles Jay’s Pluto (+0.43 harmony) – Glo’s mystical or spiritual inclination combines pleasantly with Jay’s sense of transformation, change, or power and destiny. The spiritual urge of Glo stimulates the reforming urge of Jay. Both will support and encourage each other’s spiritual enlightenment. The relationship inspires each other to meet the world with compassion and grace. Jay’s Jupiter Sextiles Glo’s Pluto (+0.24 harmony) – Jay’s sense of growth, expansion, or generosity combines pleasantly with Glo’s sense of transformation, change, or power and destiny. There is potential to build large-scale projects together. The relationship stimulates individual growth process and searches for meaning in life. Glo’s Mars Sextiles Jay’s Saturn (+0.11 harmony) – Glo’s sexual drive, temper, and powers of self-assertion combine pleasantly with Jay’s sense of commitment, necessity, or duty. This aspect is suitable for any kind of partnership including business, family, or marriage. Glo stimulates Jay’s ambition and self-confidence. Jay restrains Glo’s tendency to act impulsively. Glo’s Uranus Conjuncts Jay’s Uranus (neutral) – The individual sense of independence, freedom, and originality combine with ease between the couple. Both Glo and Jay complement each other’s individuality and independence. There is mutual appreciation in the relationship. Both bring out the eccentric side of one another. Jay’s Uranus Conjuncts Glo’s Neptune (neutral) – Jay’s respect for expression of individuality combines with Glo’s mystical, spiritual inclinations. There may be a similarity of social or political views between Jay and Glo. Each partner will share radical new ideas. The relationship gives a feeling that anything is possible when both are together. There is a creative union of rebellion and idealism. This can sometimes encourage Glo or Jay to evade responsibility. Glo’s Uranus Conjuncts Jay’s Neptune (neutral) – Glo’s respect for expression of individuality combines with Jay’s mystical, spiritual inclinations. There may be a similarity of social or political views between Glo and Jay. Each partner will share radical new ideas. The relationship gives a feeling that anything is possible when both are together. There is a creative union of rebellion and idealism. This can sometimes encourage Jay or Glo to evade responsibility. Glo’s Moon Conjuncts Jay’s Neptune (neutral) – Glo’s emotional needs combine with Jay’s sense of spirituality, imagination, or mystical inclination. The fusion offers strong compatibility with each other. A robust psychic connection exists between Glo and Jay. Both have an affinity in mystical, esoteric, or even occult studies. There is a minor irritation when both seem distant or aloof to the other. Glo’s Moon Conjuncts Jay’s Uranus (neutral) – Glo’s emotional needs combine with Jay’s sense of independence, freedom, and originality. The fusion excites mutual interest and is intellectually stimulating. There’s a degree of spontaneous, unexpected, and magnetic attraction linking Glo and Jay. Boredom is never a problem in the relationship. Sometimes Glo’s traditional attitude clashes with Jay’s odd behavior. The union arouses romantic feelings that can be temporary unless other harmonious aspects support it. Glo’s Pluto Conjuncts Jay’s Pluto (neutral) – The individual sense of transformation, change, or power and destiny combine with ease within the couple. Glo and Jay enjoy the same cultural references. Jay and Glo have a great time talking about the good old days since both came from the same generation. Glo’s Neptune Conjuncts Jay’s Neptune (neutral) – The individual sense of spirituality, imagination, or mysticism combines with ease within the couple. Both Glo and Jay share the same tastes in art, music, or religion. The relationship encourages positive traits of creativity and dreaminess. It also has the tendency to promote negative characteristics of laziness or indecisiveness in Glo or Jay. Glo’s Saturn Conjuncts Jay’s Saturn (-1.15 discord) – The individual sense of commitment, necessity, or duty combines with ease within the couple. Glo and Jay share the same ideas regarding security and ambitions. Both want things to be the same way and can understand each other’s problems. This aspect can have a devitalizing effect if Glo and Jay are a young couple who are doing the same wrong things together. Jay’s Mercury Squares Glo’s Neptune (-2.39 discord) – Jay’s mentality and powers of perception interact stressfully with Glo’s sense of spirituality, imagination, or mystical inclination. Glo’s indulgence in random thoughts can cause confusion in Jay’s method of thinking. Both Jay and Glo are capable of lying to each other. Glo’s willful dishonesty can lead to misunderstanding and friction in the relationship. One or both may keep secrets about past relationships as a method of self-preservation. Jay’s Mars Opposes Glo’s Neptune (-2.89 discord) – Jay’s sexual drive, temper, and powers of self-assertion confront and challenge Glo’s sense of spirituality, imagination, or mystical inclination. There is tension in Glo’s elusive reaction to Jay’s unexpected behavior. The relationship can cause emotional disturbance and extravagance in one or both. Jay’s Venus Squares Glo’s Saturn (-4.16 discord) – Jay’s sense of sexuality, attraction, or intimacy interacts stressfully with Glo’s sense of commitment, necessity, or duty. There is friction in the controlling nature of Glo and the affectionate nature of Jay. Jay feels dominated. Glo tends to impose too much responsibility on Jay. Jay’s Mercury Squares Glo’s Uranus (-5.44 discord) – Jay’s mentality and powers of perception interact stressfully with Glo’s sense of independence, freedom, and originality. There is friction when both minds meet. Glo may seem unstable and erratic to Jay. Jay may seem elusive and contradictory to Glo. Glo stimulates, excites, and irritates Jay’s mind simultaneously. Jay can’t understand the complex mind of Glo. Understanding and adjustment to each other are difficult to achieve in the relationship. Glo’s Moon Squares Jay’s Mercury (-6.18 discord) – Glo’s emotional needs interact stressfully with Jay’s mentality and powers of perception. There is friction in the mismatch of tastes and interests. Glo is hypersensitive and tend to misinterpret Jay’s intentions. Jay pays no attention or ignores the sensitive nature of Glo. Arguments and debates are common in the relationship. Jay’s Mars Opposes Glo’s Uranus (-8.99 discord) – Jay’s sexual drive, temper, and powers of self-assertion confront and challenge Glo’s sense of independence, freedom, and originality. Both are strong-willed, and this causes tension in the relationship. Jay resents the quiet side of Glo. Glo dislikes the over emotional side of Jay. Both have an irritating effect on one another which in time can affect their health. Glo’s Moon Opposes Jay’s Mars (-9.88 discord) – Glo’s emotional needs confront and challenge Jay’s sexual drive, temper, and powers of self-assertion. There is tension when Jay becomes rude or aggressive toward Glo. The relationship can show signs of intense physical attraction and a negatively smothering emotional reaction. Serious personality conflicts can exist between Glo and Jay. Nagging, abruptness, and even refusal to calmly talk things over will be a frequent irritation in the relationship. There are 6 mutual receptions in Glo and Jay’s planet combinations. Planets in mutual reception enhance each other. This will add +60 harmony to the total score. The remaining -11.29 discord is due to some minor aspects or planets in parallel. 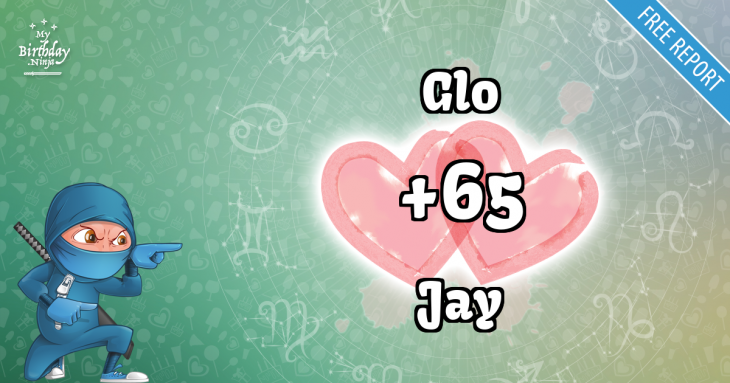 This is only a quick assessment of the relationship compatibility between Glo and Jay. If both place and time of births are known, an in-depth interpretation is available in the Star Lovers Report. Try a free sample with no obligation to buy. Ssshhh! Glo, don’t let Jay know. You are most compatible with a person born on October 5, 1963. You have a whooping birthday love match score of +168 with that person. Check it out and imagine what it feels like to be with your soul mate.